"The talk was incredible. It really opened my mind." – Huge, Inc.
Nadine Strossen’s talk provides a rigorous yet astonishingly accessible and eye-opening explanation of the First Amendment’s free speech clause, a fundamental democratic principle which is often misunderstood by the general public. It was very educational, knowing that censorship can be discriminatory. It’s such a fine line. Satire is a great weapon against hate speech. 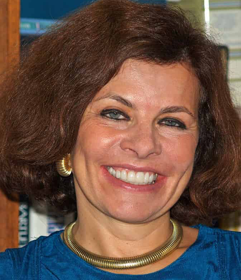 – Huge, Inc.
Nadine Strossen has been much appreciated by our corporate audiences not only for her stirring message to use our voices to resist hate, but also her fact-filled comparative analysis of speech-related laws both from a historical and cultural standpoint. Nadine Strossen takes the audience back in time by analyzing the plight of minority group activists such as those advocating for racial and LGBT rights whose speech was, at the time, itself considered “hate speech” by many. Today, Black Lives Matter speech is referred to as “hate speech” by opposing groups. She also takes her audiences across the pond to Europe, to examine France and Germany both of which, to this very day, enforce strict “hate speech laws” passed after WWII either to little or negative effect. At our event at Huge, an award-winning digital agency based in Brooklyn, Nadine Strossen discussed the role and impact that technology platforms can have on the circulation of ideas. Because private sector actors are not governed by the Constitution, they are free to censor whatever speech they want including speech that does not pose a direct, serious and imminent harm. She encourages platforms to follow the two bedrock free speech principles adopted by the supreme court to ensure that all voices are heard equally: the content neutrality and emergency principles. Nadine Strossen’s talk provides an extraordinary learning experience that spans the legal, cultural, historical and social realms – with the goal of promoting and preserving fundamental equality and tolerance for everyone. Given her busy schedule and nation-wide book tour, we are grateful that she is able to make time for our corporate clients looking to promote diversity, equality and inclusion in their workplaces. Nadine Strossen's newly released, acclaimed book HATE: Why We Should Resist It with Free Speech, Not Censorship (Oxford University Press, 2018) is available on Amazon. Contact us to learn more about Nadine Strossen, her mind-expanding talk, and our end-to-end service for an event at your company.